Read the .com Disclosures guide for full details. First, it’s important to understand the environment in which this guide was published. With the first release in 2000, the .com Disclosures guide was an attempt to narrow the gray area of how marketing and advertising worked on the Internet so companies could maintain compliance with consumer protection laws. 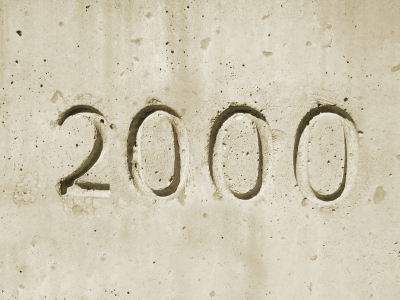 When the initial .com Disclosures guide came out, we were breathing a heavy sigh of relief having “survived” Y2K. There was no such thing as an iPhone (first sold in 2007), Twitter was 6 years away, MySpace was on the horizon (2003) and many were eagerly awaiting Windows XP (2001). A lot has changed since the year 2000. Image source: iStockPhoto. Even more important, a lot has changed since the research that went in to creating the .com Disclosures guide was done back in the late 1990s. More than a decade of technology has come along and how we communicate now is vastly different than it was 5 years ago, let alone 13. For the past several years, advertisers were trying to overlay new technology onto guidelines that never projected the platform. And in trying to do what’s right, there have been instances where it has all gone wrong. While the .com Disclosures guide of 2013 does reduce some confusion, it does not eliminate it entirely. Before breaking down some of the key points, if you read the guide one thing you’ll likely notice missing is how all of this applies to nontraditional businesses. Bloggers, entrepreneurs and startups, for example, may not consider themselves digital advertisers but, in fact, many are. It's important to know how this will affect your business to avoid confusion. Image source: iStockPhoto. In addition, many of the examples presented don’t relate to how many online companies market or advertise their products or services. In my opinion, the biggest disadvantage of the update is it’s still heavily weighted toward “big company” digital advertising and does not provide much guidance for nontraditional marketing and advertising programs. 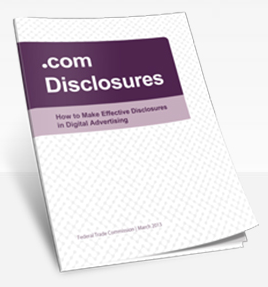 As marketing, brand, social media, PR and digital professionals, what does the 2013 .com Disclosures guide mean for you? With regard to consumer protection laws themselves, not much. With regard to how digital marketing and advertising programs are executed, there will likely need to be changes. The .com Disclosures guide is not definitive law. Rather, the guide is just that—a guide. For all the times you’ve wished you knew exactly what the law meant, this is your gift. Consumer protection laws have not changed and the FTC still maintains oversight of most of those laws. Consumer protection is to ensure the rights of consumers as well as fair trade competition and the free flow of truthful information in the marketplace. Image source: iStockPhoto. Truth in advertising laws have applied to every aspect of web and mobile communications since the technologies were developed and as they change. There is no change in the fact that all consumer advertising and marketing must be free from deception and unfair practices. The guide was designed to offer insight into common consumer advertising and marketing programs that seem to be of greatest concern to the FTC regulators. Since consumer protection laws apply to everyone who advertises or markets to consumers, so does the .com Disclosures guide. 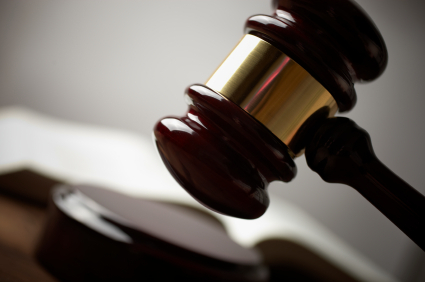 Compliance with the guide is voluntary; however, practices inconsistent with the information provided in the guide can be the basis of corrective action taken by the FTC. While the FTC has specifically stated that they are not monitoring blogs, websites or individual social platforms, the agency is fielding thousands of consumer complaints daily. A one-off inconsistent blog post won’t likely be enough to draw the agency’s attention, but a pattern of noncompliance by bloggers may trigger an investigation of a brand’s or agency’s practices. If you’re working with a brand or agency, pushing their message on your website (whether paid or not), appropriate disclosure will be expected. As a digital marketing or advertising professional, it will be of significant importance to ensure all programs with third parties include appropriate disclosures. 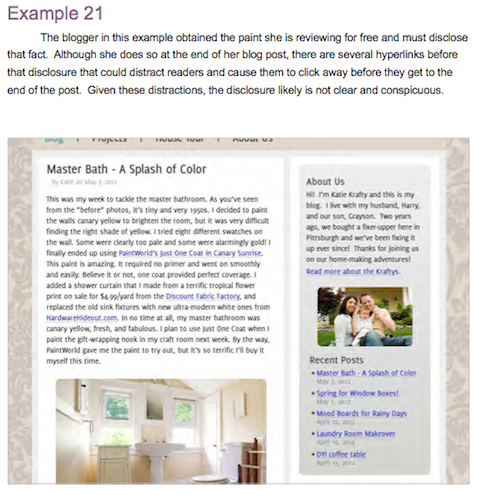 One example in the guide (Example 21) included a sponsored blog post and specifically noted that the blogger, while including a disclosure, should have placed her disclosure differently. The FTC considers that this blogger should have made the disclosure more obvious. See the Examples section at the end of the .com Disclosures guide for all examples. While bloggers may be required to place a disclosure in accordance with laws related to endorsement and testimonial advertising, clearly the FTC is including bloggers in this new guide as well. There are various schools of thought about automating social engagement, but those who use some form of automation will need to review how it’s used and, if necessary, what changes may be needed. The FTC has made it very clear that the inability of a platform to allow for an appropriate disclosure does not excuse the need for disclosure. While hashtags allow for easier searching on some platforms, the FTC has not specifically said hashtag use would or would not make a disclosure compliant. The hashtag is used by many across platforms. Some platforms are adding hashtag trackability. Others are removing it. The FTC wants to focus on the message, and adding “#” before a word, in their view, is not necessary. Is it helpful for the brand? Maybe. But remember, the FTC’s focus is consumer protection. The FTC has clearly stated that if your advertising message and disclosure cannot both be made in the limited number of characters, then that medium may not be appropriate. The goal of the disclosure is to allow consumers to understand that what they will be reading or clicking on is an advertisement, is sponsored, or involves some type of business relationship that may have influenced the information provided. In Example 15 of the guide, using the words “ad” or “sponsored” may be sufficient if provided BEFORE the message. You must make full disclosure obvious on all social platforms. See the Examples section at the end of the .com Disclosures guide for all examples. For disclosures that are lengthy or unable to fit in a space-constrained platform along with the message, the advertiser may link to a website where the disclosure is clear and conspicuously displayed. As with all truth in advertising laws, the consumer must know he or she is being sold to before reading something or taking action to purchase. And keep in mind that the advertising or marketing message may require more than one disclosure. When it comes to digital advertising, there are many variables that play into how a message is delivered. Sites are optimized for different browsers, mobile devices vary in size, apps use different interfaces and yet the exact same information may be shown. How consumers see the information may impact their ability to determine the truthfulness of the message. Check out the full text of the .com Disclosures guide to find out all of the suggestions provided. Be mindful of technology limitations or quirks. Many consumers hate pop-ups, so they install blockers on their browser. There are some mobile operating systems that do not read certain scripts. And there are apps that may have limitations depending on whether they are free or paid. Despite all of these unique characteristics of technology, digital advertisers and marketers must ensure their disclosures are seen by consumers. It is the responsibility of the advertiser to ensure that all providers (be it their own website, social media platforms or blogs) are capable of including an appropriate disclosure. If a disclosure is included in hover text but a consumer can’t see hover text on a mobile device, this will not be considered a meaningful disclosure. Disclosures that are on subsequent pages on some mobile devices but not on others need to be standardized so consumers aren’t forced to hunt for them. In today’s online media, it’s not uncommon to find advertising and marketing promotions driven by social media shares or blog posts. While many brand and PR reps want to respect the authenticity of the hired influencer, the fact remains that the advertiser (the brand, the PR company, the digital agency, etc.) will most likely be held responsible if the FTC determines consumer protections were missing and corrective action is necessary. Bloggers are often unsure what, if any, disclosure is required. Since the consequence will likely fall to the advertiser, the advertiser (whether it is the brand, the PR company, the digital agency, or the like) should feel comfortable providing guidance to any and all parties and platforms about what disclosure may be required and where the disclosure will need to go. If you want to use a hyperlink for your disclosure, take the time to read pages 10-13 of the guide and seek legal counsel to ensure your link will be deemed adequate. How many of you have ever clicked on a disclosure link at the bottom of a website? How many have seen a graphic at the bottom of a page you were reading and had no idea what it really meant? In an effort to be compliant, companies have formed to “help” brands, online companies and bloggers meet FTC disclosure requirements. 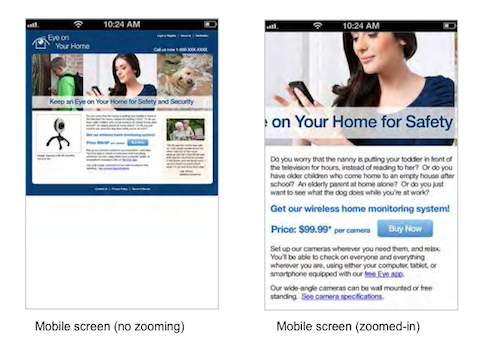 Unfortunately, for the average consumer, these custom links or graphics are not meaningful disclosures. If you, an online professional, aren’t always sure what something like http://discl.se/Level6 would mean, then neither does the average consumer. You can find this example of insufficient disclosure in the .com Disclosures guide. This is not to say hyperlinks to a disclosure page are always inappropriate. In certain circumstances, such as when a lengthy disclosure is necessary or the disclosure is not integral to the claim, a hyperlink to a disclosure may be acceptable. 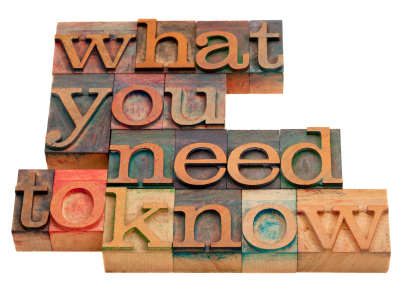 For most circumstances that trigger a disclosure, a hyperlink may not sufficiently alert the consumer to information needed to make an informed decision if the link is not accessed. Relying on hyperlinked disclosures requires the consumer to be sufficiently educated to know they must click for important information. Overall, the 2013 .com Disclosures guide provides insight into what an FTC investigator may be looking for when evaluating digital advertising and marketing programs, claims and promotions. The FTC recognizes technology is continuously changing. However, enforcement will continue to be scrutinized using traditional criteria, which may not wholly translate to these new and innovative platforms. While the guide provides detailed insight, what it is clearly lacking is the “when.” It contributes greatly to the “what” and “where” with regard to disclosures, but still leaves advertisers and marketers searching for clear guidance on exactly when one is required to disclose. What are your thoughts on the new updates to the FTC .com Disclosures guide? Will it make your job easier? Do you think it will be helpful in creating programs for online influencers or working with brand/PR reps as an online influencer? Leave your questions and comments in the box below. Disclosure: While Sara Hawkins is an attorney, this article is for informational purposes only and is not to be considered legal advice. If you are in need of legal advice, please consult legal counsel. Sara Hawkins is a lawyer, blogger and doer. No longer happy waiting for someday to find her, she's finding ways to make her somedays happen.